This page will run down the top 3 cheap travel guitars as rated by users, covering 3 key categories - ultra compact acoustics, compact acoustics and electrics. While reading through this page, if you haven't already, decide what are the most important features you want in your travel guitar. Do you just want the most compact solution available - something that'll fit in your hiking bag? Perhaps you don't want to sacrifice too much on tone and feel vs size. Would an electric travel guitar be more suited to your practice needs? This guide will help you make these decisions and present you with the most highly rated guitars in the budget price range. Anything below $400 has been considered, but as you'll see, you don't even need to spend half that for a quality travel guitar. Opting for a cut body size but with a full scale neck, Washburn's Rover RO10 retains the feel of a regular acoustic in your fret hand while maximising portability. 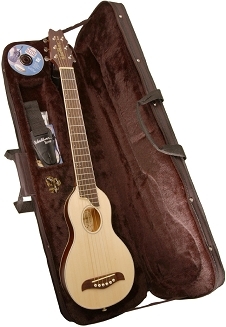 A great value and highly rated acoustic package that includes a rather swanky case and some useful extras. For many players, Washburn have got the compromise between portability and playability just right. The neck feels like a proper adult guitar neck - it's not something you have to spend a lot of time adjusting to, and that's clearly an important factor for those who get short, intermittent periods of play time on the road. The materials and components are of surprisingly high quality for such a cheap travel guitar. On first impressions, it doesn't look or feel cheap. This quality is confirmed with the solid spruce top and mahogany body and neck giving it the depth and robustness that travel guitars of this size so desperately need. Compared to others in its price range, the RO10 is actually one of the more sophisticated and beautiful specimens, with detail such as the binding giving you an overall feel of quality. Even the open gear tuners look especially elegant. As expected, the sound you get from the compact body is more like a ukulele, but there's plenty of volume, sustain and responsiveness to entertain even your rowdiest fellow roadies. Users recommend replacing the factory fitted strings to really wake the Rover up. While strumming might sound a bit weedy, the resonance of the RO10 will definitely inspire you to work on your finger picking when you get back to the hotel or campsite and, because the neck, and therefore the nut width is "proper" size, you'll take any developed muscle memory back home to your full size. Some prefer their travel guitar to retain the traditional, full sound of a steel string dreadnought, if slightly smaller and lighter, and sacrifice some portability points. The obvious choice is a 3/4 size guitar. The Luna Muse Safari is a great option for those players who don't want to lose the low end and the feel of a more familiar body on their lap when travelling away from home. On first appearences this your typical short scale 3/4 size guitar with a satin finish. Although it is available with a spruce top, it's the all mahogany version what separates the Safari from others in its price range. That, and the attention to detail on aesthetics such as the "Celtic laser etched" sound hole and the unique inlay moons from waxing to waning at the 19th fret. Users generally feel the Luna easily fulfills the travel criteria - lightweight enough even for hikers, compact enough to fit into overhead compartments (if not quite as tight as the Rover) and cheap enough to not worry about the worst happening. But what makes this one special is the presence of that baritone warmth that many acoustic players would sorely miss on the road with the Rover. The Safari sounds less like a ukulele and more like a... guitar! Strumming isn't strangled and the mahogany gives finger picking depth. Some users have even found themselves picking up the Safari back at home more than their 1st guitar. You do get the feeling Luna have specifically engineered it to get the most possible tone and projection from such a small body, and not scrimped on quality checking either. Overall, a clear favourite in its price range for those who want a more moderate compromise between a full size and a ukulele scale. No definitive cheap travel guitar guide would be complete without an electric offering. The Traveler Speedster is another clear winner among jet setting and even hiking electric guitarists, allowing them to practice their rock and metal solos and riffs away from home with portable amplification (e.g. a headphone amp). To travel guitar virgins, the Speedster looks a bit... weird. The first thing you probably notice are the in-body tuners and, therefore, the lack of a headstock (commonly associated with Steinbergers). But of course, this does not fundamentally change how you play it. You still get the 22 fret, 25 inch scale (same as a standard Les Paul). Another striking feature is the removable arm rest, giving your strumming/picking arm support when sat down. However, the Speedster also boasts features that are reserved for high quality electric guitars - a one piece neck through body construction meaning maximum sustain, clear and high output dual rail humbuckers and quality materials. Users note it can be a little tricky to play sat down at first, and prefer standing up using a strap, but Traveler have clearly opted for the full scale neck and a smaller body as the logical compact solution. Now, you most likely won't be lugging an amp with you on your travels, so you'll need to invest in either a headphone amp or portable amp of some kind. The humbuckers with tone and volume controls are adequate for any practice session - just don't expect to draw any meaningful comparisons to the pickups in standard sized electrics. The Speedster is purely for practice and getting ideas on to the fretboard. Saying that, when comparisons are made to regular guitars, the action on the Speedster can be set incredibly low without buzzing and there is a truss rod installed so you can make the usual adjustments as you wish. Best For Travelers who want the most compact acoustic solution possible with a regular scale neck. Travelers who want to compromise less in both tone and body feel but still need a compact solution. Travelers who specifically want a compact electric guitar for use with portable amp. Defining Features Ultra compact body. Solid top. Mahogany body & neck. Hard case included. 3/4 size. All mahogany body available. Gig bag included. In-body tuners. Dual rail humbuckers. Neck through body. Optional arm rest.